Is it week 4 already? Where does the time go? We are already one month into the One Room Challenge and I am so excited! It’s hard to believe there are only two weeks remaining! I hope you have been following along, but if you need to get caught up, you can do so below. This week was quite similar to last week in that I spent a good amount of time shopping online. I had to order the pieces I needed or they might arrive too late. 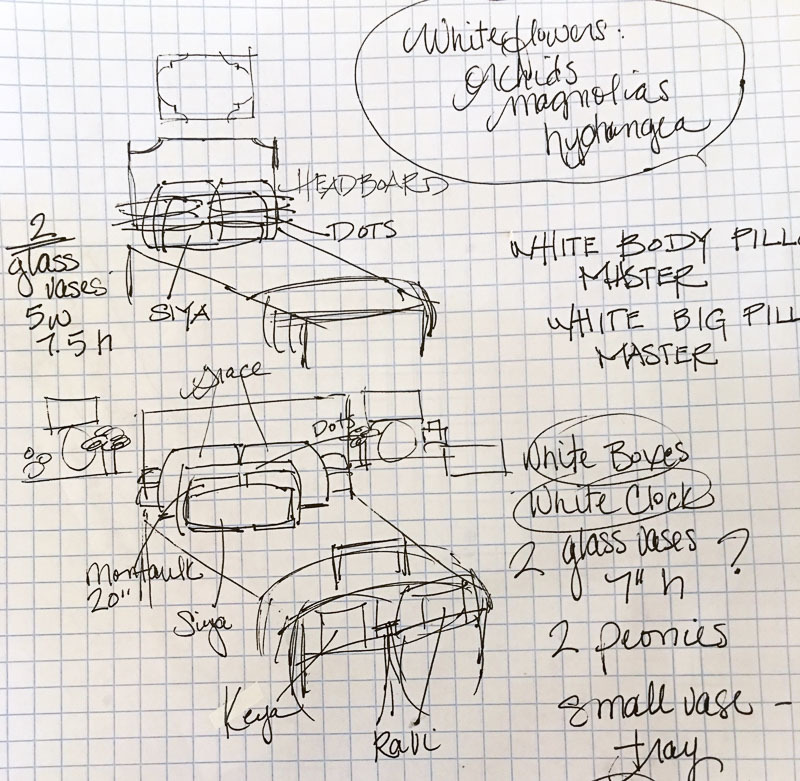 First, I set aside some time for drawing and making notes. I thought it would be fun to share…..please don’t judge! I did manage to select all of the bedding for the One Room Challenge this week. Personally, this is a huge undertaking and the high point of my week. I always want to choose versatile pieces that I can style in more than one way. I also try to make sure most pieces are timeless. This seems simple on the surface. Therefore, I went directly to my favorite source, Pom Pom at Home. 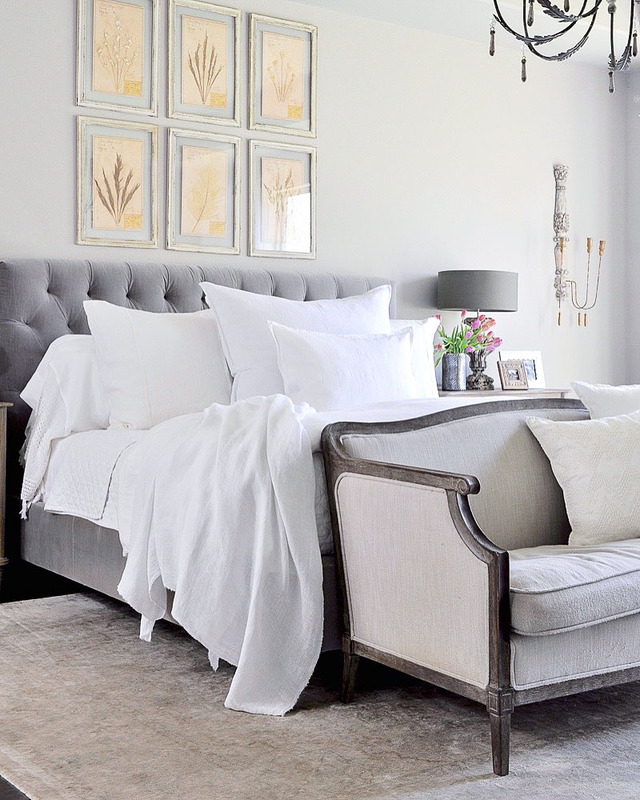 I have loved their bedding for years and use much of it in my master bedroom. 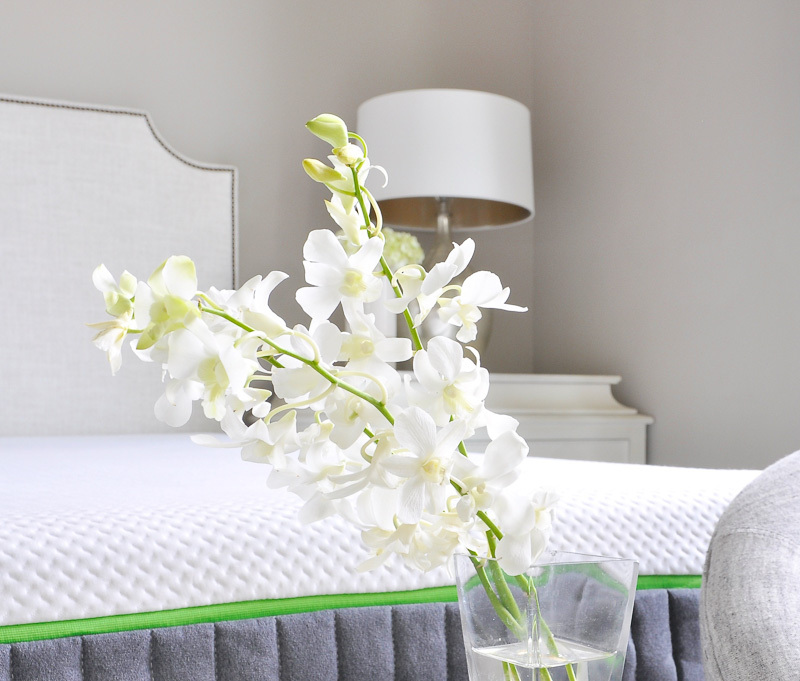 For this room, I started with this beautiful cotton velvet coverlet. I also selected a new duvet set, euros, additional pillowcases, and classic white sheets. Timeless? Check! 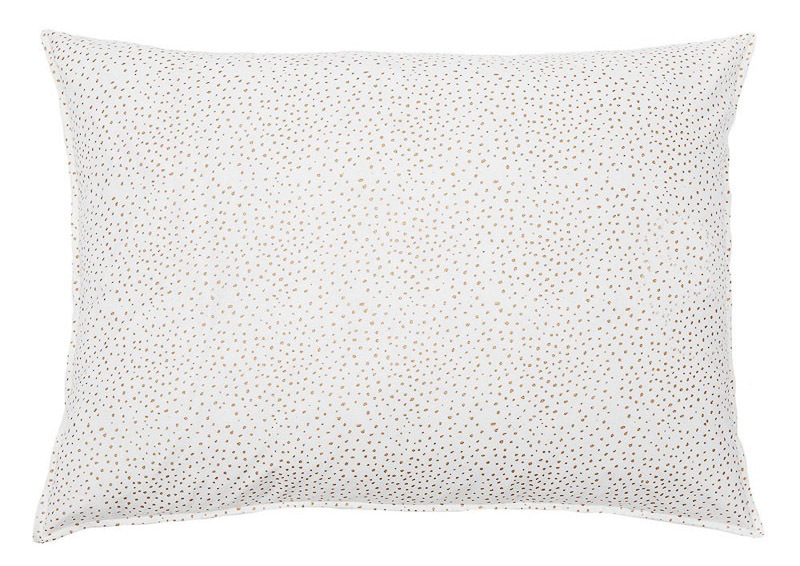 Next, I found what could quite possibly be the star of the bedding ensemble: a big white pillow with gold dots. It’s such a statement at 28″ x 36″. I can’t wait to tell you more about it when it comes in, hopefully by next week. But for now, here is a sneak preview. The big pillow above is hand blocked as is this pretty lumbar I ordered. I also purchased a round mirror for the side wall and newly released art by Pom Pom at Home. As a matter of fact, this collection is very new, so I don’t have a link yet. However, I should have one for you in a week or two, so please check back. If you stopped by last week, you know we hung the chandelier. I honestly come in here daily to visit her. Isn’t she pretty? Additionally, I am loving the new Cariloha bamboo mattress even more now that it has been raised by a new box spring. The box spring came in yesterday and I bribed my son with dinner to put it together for me. It took him 20 minutes to drive over and 10 to assemble it, so I think he was pleased with our deal. I had about 5 minutes to lay down today and spent it in this room. The mattress feels cool, which I love and it’s most definitely very comfortable. Thanks to my friends at Cariloha for providing it for my makeover. As I mentioned last week, it has excellent reviews, so it was an easy decision to take them up on their generous offer. Can you tell it is starting to feel like a bedroom? I love how the vision in my head is coming to life. This is such a fun part of this undertaking. I’m especially excited about the pretty details on the furnishings and can hardly wait until next week when I should have the remainder of my decorative items. The chest and bed are by another brand I love, Gabby Home. Chair and table by the fabulous Aidan Gray. 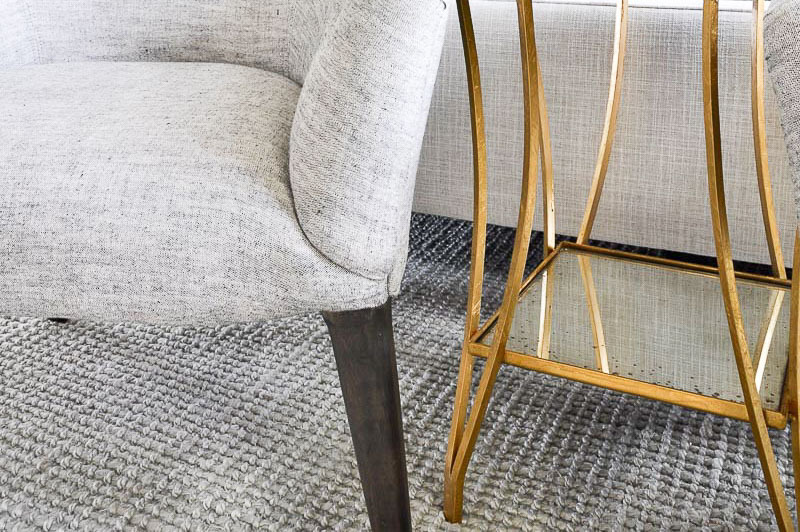 Beautiful gray rug by Jaipur Living. Thank you all so much for your visits and encouraging comments. I truly appreciate them. Be sure and stop by Calling it Home to check out all of the One Room Challenge makeovers! Be sure and follow me on Instagram because I’ll be sharing much more in my stories! Thank you Jennifer! I am so excited about them! gorgeous bedside tables! You are almost done!! Thanks so much Tim! I definitely see the light at the end of the tunnel. Love the beautiful creativity done through the top image. The mind ideas are well crafted on apiece of paper. I love it because I always love to prefer this mechanism during my college days as what comes in my mind while thinking I can put all these in apiece of paper then plan according to it. Ah, I love that you appreciate the use of paper. I too learned to use this method in college and I can’t imagine changing! I love those night stands. Can’t wait to see more! 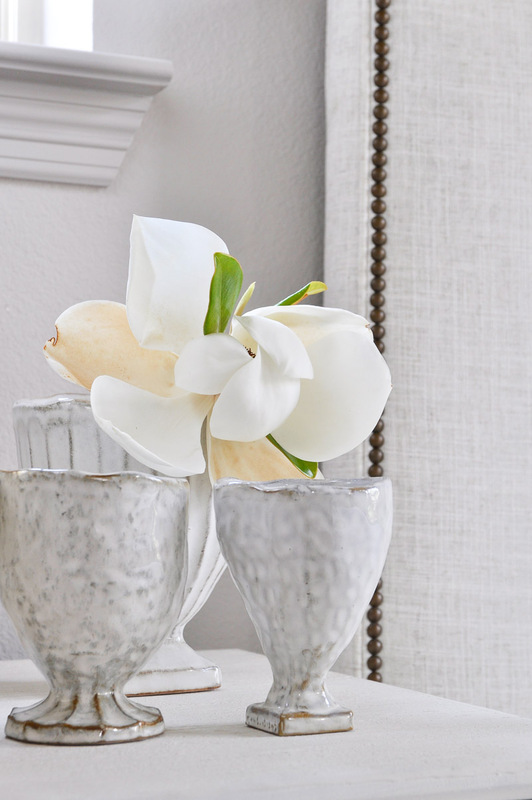 All the touches to your room are stunning and so elegant! Love it! Yes Sarah! You and I have a mutual love for Gabby and Currey & Co. It was fun to follow along on your recent trip to HP! I have never been, but I hope I can remedy that soon! So many stunning pieces! 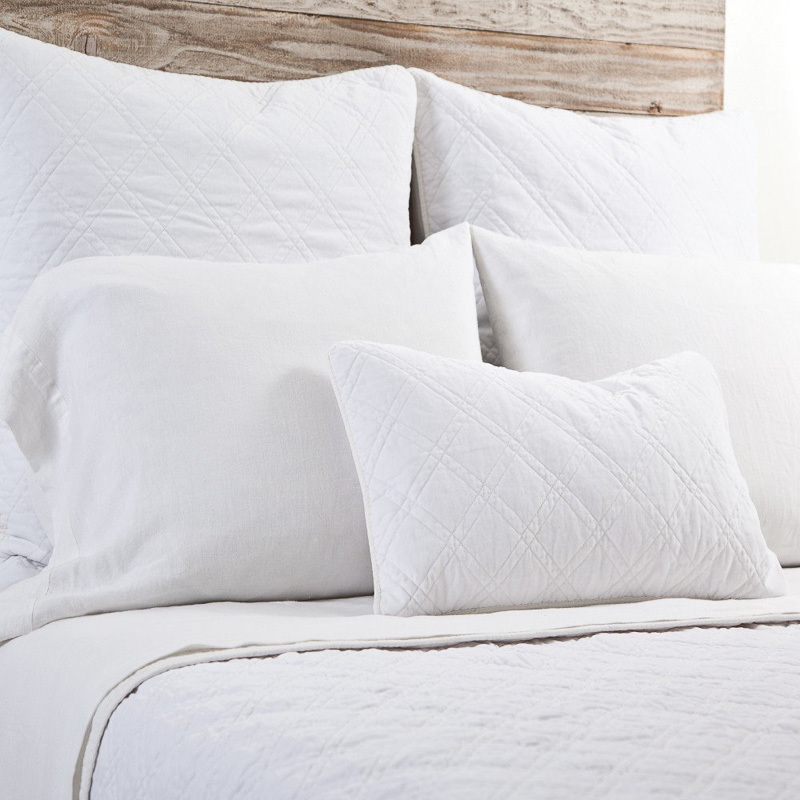 I love the bedding that you chose, all white is always a go to for me. 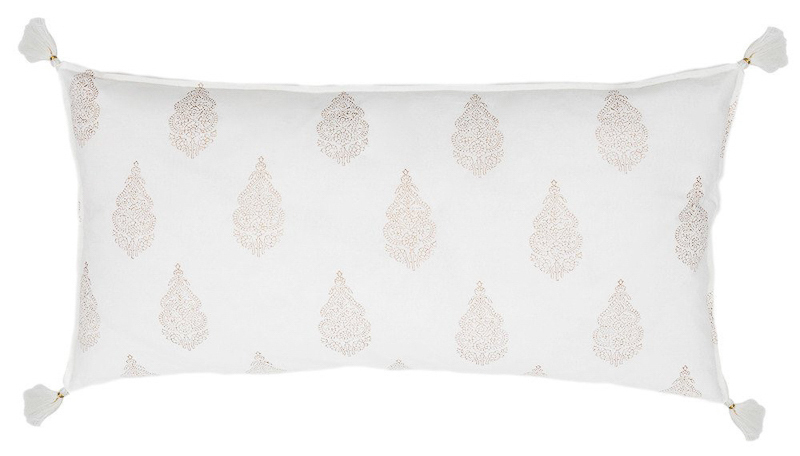 It is timeless, goes with so many different home decor styles, and always brings a sense of hygge. Thank you Charlotte! I too adore white bedding and have it in all of my rooms. It provides such a great backdrop for pops of color and I love that you can switch out your pieces from room to room! Jen, it looks like it’s going to be amazing!! And the night tables!!! Oh my!! I want them! Just gorgeous!!! Thanks sweet Tam! I love them too… so excited! Jen, you are killing it! So jealous in the midst of my being stagnant. And, those dot pillows!! LOVE! So gorgeous! I’m loving how the patterns in the nightstand and bedding play off of each other. And the chandelier is definitely still so gorgeous. You’re definitely farther along than I am! Can’t wait to see the next update! Thank you Leslie! I am so glad you picked up on the pattern play! I’ll be over to check your progress soon! Your room is stunning already. The details are amazing and I can’t wait to see it all together. We are in the home stretch! I hope you had fun at High Point! The details are gorgeous! I can’t wait to see it come together! We are almost at the finish line. Yes, so close!!! I can hardly wait to get there! This is only my second time participating in the ORC, but I”m always so surprised by just how long it takes to shop for things! 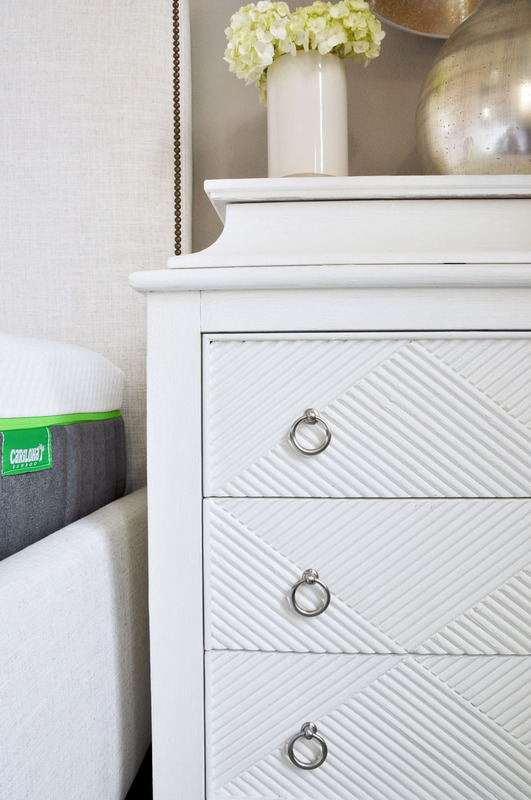 This post has me even more excited about seeing more of those nightstands – the details on those babies are amazing! Right? It’s my second one as well and I swear it has taken me more time to source products than to do the actual work!